EZ Game Booster is a piece of software that allows you to enjoy an enhanced gaming experience by rearranging computer resource usage and turning off unnecessary applications running the background and that could clog your system. EZ Game Booster takes charge of these tasks giving you a safe platform via which you can handle all the optimizations. The UI consists of two section and comes with a sleek and modern interface that is designed with tones of black and blue. While the left panel displays the categories of resources that you can access to enhance performance, the right pane allows you to view more details about the features that can be modified. The interface comes with a neat status bar where you can survey useful information about your system, such as disk space usage as well as CPU and memory usage, for instance. In addition, you can check out the battery charge status and the power remaining, in the eventuality that you are playing on a laptop. The highlight of the tool stems from the fact that it helps you identify unnecessary processes and services that are running in the background and suspending them. As a consequence, your processor, RAM and video card are going to have free resources that can be employed for enhancing the PC game you want to play. In addition, the program includes a useful defragmentation tool that enables you to speed up the loading and running of games you usually play. On a side note, the function can just as well be used for applications you have installed on your computer. You should know that program includes a useful section that allows you to quickly access the Windows tools that can modify and hence, improve the system’s performance. Windows Task Manager, DirectX Diagnostic Tool, Performance Monitor, Game Controllers and Power Settings are among the tools that can be optimized so that enhance your system’s responsiveness and performance while playing games that rely heavily on your CPU and video card. Might be a slight learning curve for some people. I gained a huge performance increase in all my games and will be keeping it as my main game booster from now on. The last thing a gamer would want to think about is a slow computer. Although you may start off with a well-performing system, the speeds will tend to drop off after some time. That is when game boosters come into play, literally. Having been on the lookout for such boosters, I came across EZ Game Booster PRO. EZ Game Booster PRO takes charge of the system resources. Its approach in locating computer resources appropriately ensures unnecessary windows services are not eating into what your game should. At the same time, expect the tool to boost the access time to your frequently accessed files. I tried out the application and here is what came into my attention. Downloading and installing the package is fast and straightforward. On launching, you note its dark-themed interface, a rather common layout in the gaming space. One thing that was clear at that point is that EZ Game Booster PRO is really meant for relatively high-specs gaming PCs. You will have to contend with longer loading times if your system has a memory of less than 4GB. From the use of icons for different settings to the general arrangement of the options you will clearly be interested. The arrangement has managed to pack a wide range of customization options without making the interface cluttered. On the right hand side of the main window, you get a quick overview of your system’s resource usage. The engaging arrangement of features on EZ Game Booster PRO gives you loads of options to enhance your gaming experience. In addition to fixing network lags, optimizing your computer’s speed, and taking advantage of the stability tweaks under Control Panel, you will get further useful options under Window Tools, Tool Box, and Defrag Game. Right off the bat, EZ Game Booster PRO’s shows ease of use. Regardless of your gaming experience level, you will quickly find your footing while using this software. A few minutes into using the program and you will realize its small learning curve. With a few clicks, you can get done what you want. While EZ Game Booster PRO will be running, you notice its impact on your system’s performance regarding resource usage. This high memory usage beats the logic of using this program to optimize your system. To fully enjoy this booster’s help, you need a game-optimized PC. This caveat may as well be directly connected to the program’s memory usage. I had to launch EZ Game Booster PRO twice in order to access it main window. That is, launch then quit and repeat the step. After initiating the launching process, I still had to head over to the system tray to double click on its icon. If you do not want to go the long route of optimizing different aspects of your computer to boost your gaming experience, you can get it all under one room in EZ Game Booster PRO. Its intuitive interface will also get you going in no time. However, you may experience some lags especially if you have a computer with limited memory. While everyone would want to get the most powerful PC in the world that could run virtually all games without any software customization, we’ve all come to terms that this could be a bit costly and system speed optimization before playing a game or launching any resource intensive application is inevitable. Doing it manually and killing processes from the task manager is quite cumbersome. This is where game boosters come into play. EZ Game Booster brings all the RAM, Processor and hard disk speed management to your fingertips. It actually saves you the time of hunting out competing programs and processes and gives you suggestions on the fly. The well laid out user interface is sufficient and will give you access to straight forward tweaks at the click of a button. The big all system tweaks button will more often than not be enough to get the job done. This combined with the fact that EZ Game Booster steers you clear of most problematic tweaks and enhances system stability makes it quite the good tool. Launching EZ Game Booster from the system tray led to a complete system hang in more than two occasions. This is such a letdown for something that is supposed to boost performance, not drop it. The inbuilt launch and quit shortcuts are a replica of inbuilt Windows shortcuts. This might be problematic if you try to control it using the shortcuts. 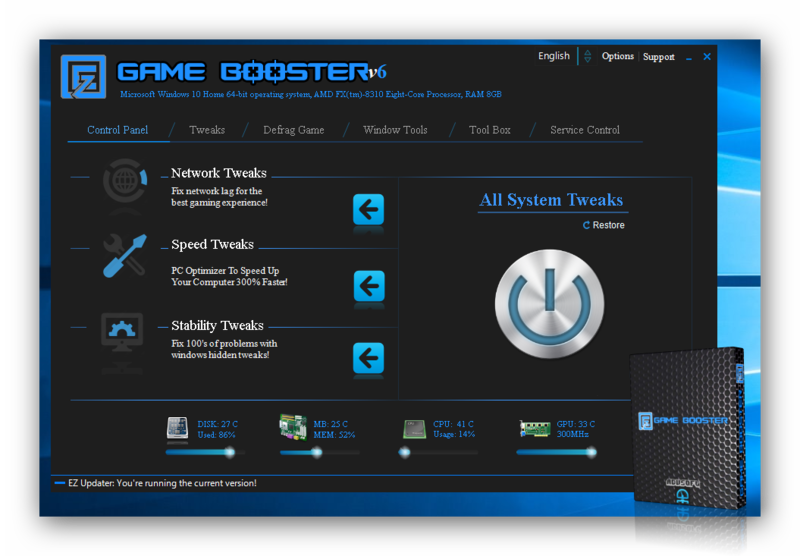 EZ Game Booster is a great way to kill all those background tasks that steal all the juice you need to ramp up your PC performance. It is a shorter and more straightforward way with a couple of checks and balances to ensure your tweaks won’t affect system stability. It’s a great time saver or tool for someone who doesn’t know their way around Windows OS.